Pilasters: Providers of DIY columns. See us for a column, house decorative column, hplc columns, porch columns, wood columns, pilaster, column caps and bases, mansion columns and decorative columns. Pilasters come in various shapes, sizes and thicknesses. A thickness of 1 3/4" tends to be a good aspect ratio for an average size room. Our exclusive lock mitre allow a novice handyman to easy control the depth of the pilaster. By simply cutting one smooth facing in half, (above) pilasters can be fitted to any thickness from 1 to 4". 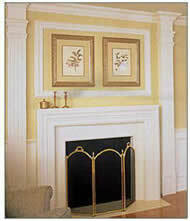 Like all our square columns, they can be smooth, paneled or fluted depending on the facing chosen. The sides are always smooth and one 8" wide side is cut down into two 4" sides (or less), we leave it up to you to cut them down on the job site. Although our facing are 8 feet tall, They do allow for 9, 8, or 7 foot pilasters or square columns.